The State of Israel is the nation-state of the Jewish people. Ignored is the fact that Israel is indeed the ancient homeland of the Jewish people. Ignored are the thou- sands of years of Jewish history and uncontroverted proof of Jerusalem as the site of the Second Temple. Ignored is the Balfour Declaration. Ignored is the British Mandate over all of the area known as Palestine, including Judea and Samaria in ancient Israel. Ignored is the UN resolution known as the “Partition Resolution” adopted in November 1947. Ignored is the independence of the State of Israel declared in May 1948. Ignored is the accept- ance of the State of Israel as a full nation-state member of the UN. Also ignored are the battles of war waged against Israel in 1948, 1956, 1967 and 1973. Israeli Prime Minister Benjamin Netanyahu speaks at the 2014 AIPAC annual policy conference. “He reminds us of our need to remain vigilant in our support of the Jewish homeland,” Heideman writes on Israel’s good name, reputation and commitment to justice, equality, morality and the safety and security of her people are also ignored by the world, as sponsored and sup- ported by the Arab League. Not to be ignored is the ongoing economic warfare ongoing against the State of Israel and Jewish- owned companies and organizations, including academic institutions, located in Israel as the object of active boycotts. These boycotts are supported by Arab countries as well as many others in an attempt to denigrate Israel and utilize the politics of fear as a weapon against Israel’s economy and her dignity. The prime minister of Israel, Benjamin Netanyahu, recently in Washington to meet with President Obama and to address AIPAC’s annual policy conference, asked the president, AIPAC and the peo- ple of the world to recognize and act against the real threat to Israel by the Islamic Republic of Iran. He reiterated the right of the State of Israel to be recognized as a Jewish state. He addressed the ills of the boycott and has made it clear that acts of economic boycott are acts of anti-Semitism. In stating “Israel isn’t what’s wrong with the Middle East; it’s what’s right with the Middle East,” Netanyahu reminds us all of the centrality and importance of the State of Israel in the hearts of the Jewish people throughout the world. He reminds us of our need to remain vigilant in our support of the Jewish homeland. to stand up for our beliefs while secure in our homes and home- land are precious rights we each possess. In that spirit, let us not be silent about our past; let us remember and honor those who have perished; and let us rededi- cate ourselves to speaking up for our dignity, our safety, our securi- ty, our religion and our beliefs. The State of Israel is indeed the nation-state of the Jewish people. Let it be recognized as such. Richard D. Heideman is a Washington, D.C. attorney. 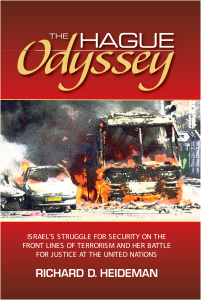 He is the author of The Hague Odyssey: Israel’s Struggle for Security on the Front Lines of Terrorism and Her Battle for Justice at the United Nations (Bartleby Press; see theh- agueodyssey.com).